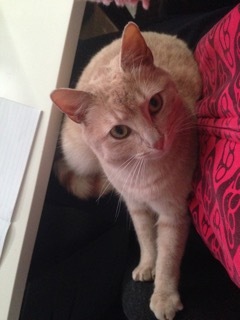 Back in September we introduced you to ginger tabby Saffron, or Saffy, who had ran away from home after being spooked by New Year fireworks. However, thanks to a microchip and her details being up to date, Saffy was safely reunited with owners Jo and Avi after being brought into The Lost Dogs’ Home’s North Melbourne shelter. 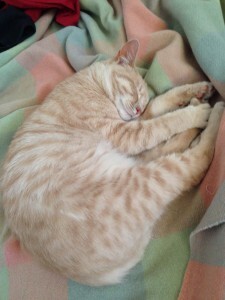 Now four months on we caught up with Saffy’s owner Jo to see how this lovable cat has adjusted back into her home life. “We were a little worried that she would be confused with her new surroundings and have trouble settling in as the place we are in now is different to the home she left. “However, she didn’t seem put off by that at all! She quickly made herself at home,” said Jo. For Jo, it has been great for her to have little Saffy back at home. “Saffy has a cute little face with a serious little expression which I greatly missed. I am happy to see that around the house again. Being reunited with Saffy after nine months really brought home the importance of microchipping and identification to Jo and Avi. “It is always important for any contact details to be up to date so if anything occurs you have the hope of getting them back. “Having Saffy run away also brought home the importance of also having a council or ID tag on your cat’s collar with current contact details. “Even if they are an indoor cat, having the necessary identification on your pet is important as you never know if they will run away,” said Jo. For more tips on pet safety, download our Holidaying without your pet and Holidaying with your pet fact sheets. ChipChecker at a park near you! December is National Pet ID Month and National Pet Register is calling on you. Not sure if your pet’s identification and details are up to date? Now is your annual reminder to check your pet’s microchip and contact details. 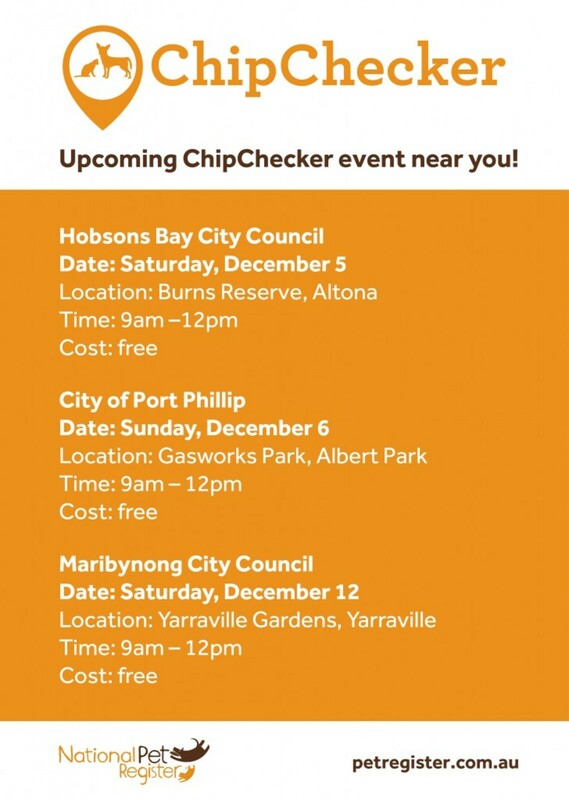 Look out for ChipChecker events in your area this weekend. The ChipChecker team will tell you what details are on your pet’s microchip, what database your pet is registered to and whether your pet’s microchip is working. You can also use ChipChecker to update your details and use the opportunity to ask National Pet Register staff any questions you have about pet identification. Don’t forget to bring along your pet’s identification or your pet. If you bring your pet along, please remember to keep all dogs on a lead and all cats in secure carriers. For more information on identification, or to learn how to update your details, visit petidmonth.com.au, petregister.com.au or call National Pet Register on 1300 REG PET.